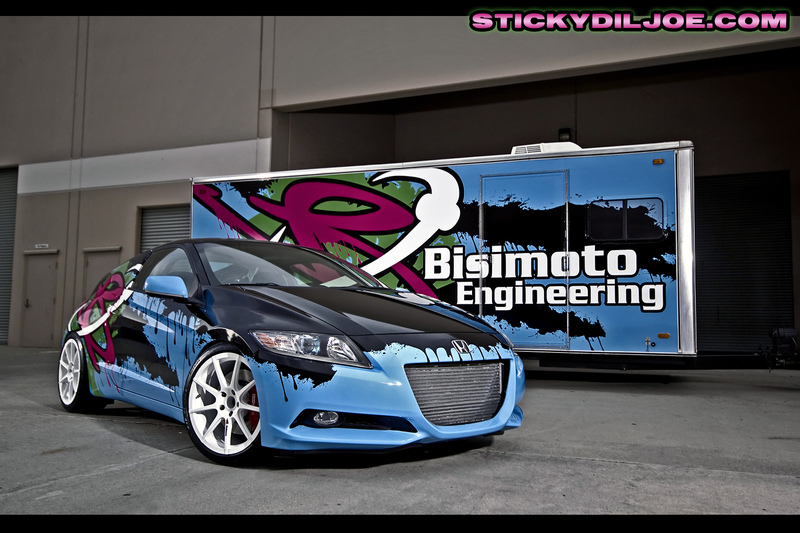 With the SEMA 2010 event finally occurring this week, I can finally release these photos to the public. The car has been ready for some time now but due to contractual obligations, no photos could be released for it until this week. If you haven’t heard of the Bisimoto CR-Z before, be prepared, because it was quite a shock for myself to see it the first time. The graphics scheme alone is enough to dramatically pull your attention away but where this CR-Z truly shines is under the hood. Bisi has been hard at work trying to maximize the potential of the CR-Z and the dyno sheet below says it all…Enjoy. I didn’t take too many pictures that day but I must thank Bisi for giving me the first opportunity to photograph the car for the public. Specs will be released soon, for now, just enjoy the Bisimoto CR-Z in all of it’s glory…. That is so sick and crazy! I was wondering when someone would do this! Im going to venture out and take a wild guess…he swapped in a k20. If not I’ll be flat lining if he built that hybrid motor. Henry, that is in fact the hybrid IMA L15 setup the car comes. I’ve keeping up with the build thread and as far as I’ve understood everything still works, the car even retains the 3 driving modes, normal, economy, and sport. I don’t know how all it all works now, but it’s pretty impressive. As soon as the engine bay pic came along as i was scrolling. I almost spit out my coffee. Somewhere in the universe a galaxy just exploded causeof how awesome this is. Looks great!!!! Im lovin the wrap. Even though the car is black it still looks like a Bisi ride. The bay looks awsome as usual too!!! WOW!!! Bisi is killing it!! Awesome stuff Bisi! Can’t wait to see this car tomorrow in Vegas! always getting the goods! is it still a hybrid? so many questions i’m sure they will all be answered at SEMA! this thing is so sick. especially that it still has the 1.5L CR-Z motor and make good power. I was expecting a humble k-series swap….But instead I been slapped in the face by a 450hp+ single cam….Bisi laying down the law! Bisimoto loves him some Turbonetics. OMG, he did it again…!! !